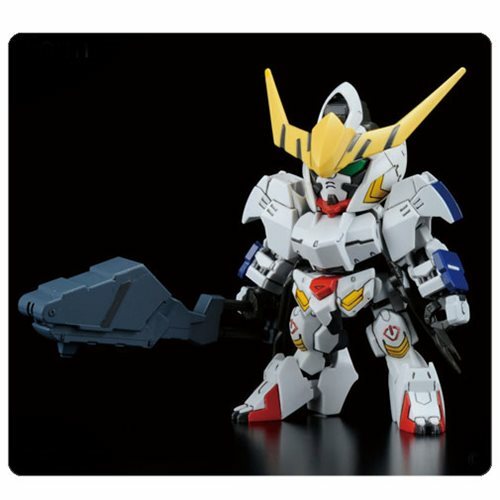 From the Gundam BB Senshi line, you can create the 1st to the 6th form of Gundam Barbatos! The Kutan Sangata is also included and each form can be recreated using an abundance of option parts. You can also use the parts to customize the HG Barbatos arm with the blade. Set includes mace, smoothbore gun, large custom mace, arm-mounted trench mortar, arm-mounted machine gun, waist-mounted reactive armor, and kutan sangata. Comes with 8 Runners, a Foil sticker sheet, and Instruction manual. Measures approximately 3-inches tall when complete.